As the saying goes, ‘a dream without a plan is just a wish.’ Becoming a novelist requires not only creativity but consistent work. It’s much easier to be consistent about writing your book when you have a realistic schedule in place. Sci-fi novels tend to run longer than, for example, YA books. According to Chuck Sambuchino at Writer’s Digest, a decent length for a sci-fi novel might be 100 000 words while a YA novel may be as short as 55 000 words. Once you have an idea of length, divide this by 30 to find the average number of words you need to write per day in November (if starting your book from scratch). Remember to be realistic: If you intend to write a 100 000 word sci-fi space opera, you’ll need to write an average of 3333 words per day to finish in the time-frame. If you have a 9 to 5 job this might be impossible. Aim instead for a 60 000 word book. This will leave 2000 words per day and you can always expand on your first draft after the end of NaNoWriMo. Are you taking breaks for smaller milestones? Every 900 words, for example, get up and make yourself a warm beverage or take a brief walk outside. Do you have a clear idea of your average words per minute? Say, for example, that you write 30 words per minute, in 30 minutes of solid writing you will have 900 words. Breaking up your time this way makes writing a novel within one month much less daunting. Scene: Gary has a mid-life crisis and buys a motorcycle. Purpose: To show that Gary can be impulsive sometimes which will foreshadow and explain his actions when he quits his job and goes on an epic road trip. Of course you might prefer not to outline beforehand and see where the scene and characters take you. 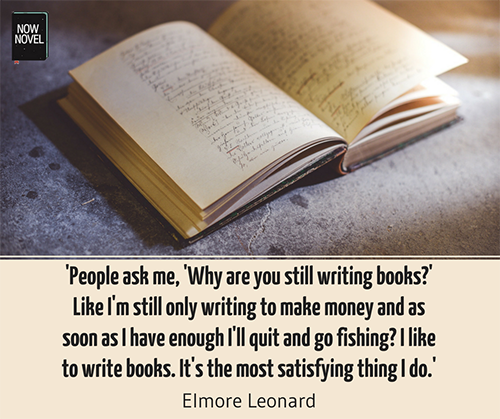 But even with a goal – not only for word count but for each writing session – you can exercise freedom. What’s more, it’ll make it easier to stay motivated and focused and draft your novel faster. Often what we see as lack of motivation is equal parts lack of focus. You sit down to write but end up doing other things (checking Facebook, reading posts on websites like Buzzfeed and Mashable, and so on). 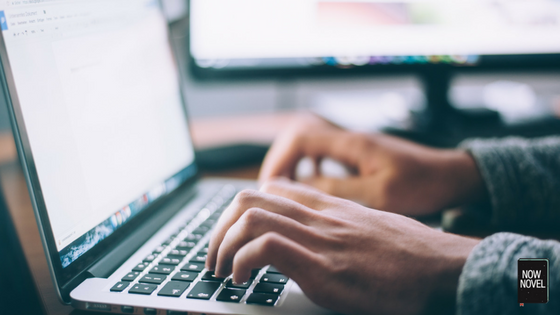 If necessary, install an internet browser extension for writers that blocks the distraction-centered websites you visit most frequently. You can group distractions into two categories: Feel-good and must-do. The ‘must-do’ distractions are those duties and obligations that might distract you from your writing but are unavoidable. If you have children who need your attention and time, schedule your writing time for when they are asleep. Try to start seeing the must-do breaks from writing as rewards too. That way it will lessen the sense of frustration that comes with distraction – a potent motivation killer. If you need to do household chores, for example, let the mindlessness of the task provide you with a chance to replenish mental energy after you’ve been focusing hard. This is better than trying to use this time to plot or plan scenes in your head, as true off time will let you resume your work feeling more refreshed. Part of what makes motivation difficult for aspiring writers is that the reward of finishing a book can seem very distant and intangible. Rewarding yourself for reaching milestones will keep you focused and motivated. Is there something you’ve been saving up for and have been meaning to buy? Tie obtaining what you desire to reaching your writing goal, so that you increase the sense of achievement. Rewards don’t have to be material, and doing activities you enjoy is actually one of the best rewards. Schedule a night out with friends, watch a movie you’ve been itching to see, or indulge in an activity that brings you joy and calm, be it yoga or an outdoor hike. The key is moderation and delayed gratification. Stretch out the things you love and enjoy them as you become a novelist, word by word and reward by reward. One of the joys of NaNoWriMo is that it has its own in-built reward system too. For every milestone you reach, you can display a badge on your profile that shows that you are motivated and committed to finishing your book and becoming an author. Sometimes it’s best to get an encouraging word or a suggestion for overcoming an obstacle in your writing from a small writing group. Many famous writers have found the motivation and perseverence to write amazing books through close association with other writers. C.S. Lewis (who wrote the Narnia fantasy series) and J.R. Tolkien (author of The Lord of the Rings) were in a writing group together called The Inklings at the University of Oxford. When it’s time for a break, join other writers and read any extracts they’ve shared or simply chat and enjoy some well-earned social time. Gather inspirational or motivational quotes and images that make you feel emotionally driven to finish your book. Write a list of 5 positive benefits of writing a book. (E.g. ‘I’ll discover important things about myself’ or ‘I’ll have the satisfication of finishing what I’ve started’). Post them prominently in your writing space to remind you why you’re participating in NaNoWriMo in the first place. This will help you keep your eyes on the finish line. One of the biggest challenges to staying motivated is the fact that you have to find the will to finish telling your story yourself. Even so, a gentle external push coupled with guidance for overcoming obstacles gives extra motivation. A writing coach provides accountability that makes you answerable to someone other than yourself. Your coach can also give practical advice for increasing your productivity and eliminating distractions. Know that there will be times that feel like harder work and less creative play,and have a plan for how you will make the less fun side of writing more enjoyable. For example, if your characters are boring you, introduce a secondary character and create some passing conflict. Conflict can quicken your story’s pace and draw out important character attributes. Whenever you feel the urge to quit, leap in at a different scene, make a character do something unexpected, or find some other way to switch things up. Feeling motivated yet? 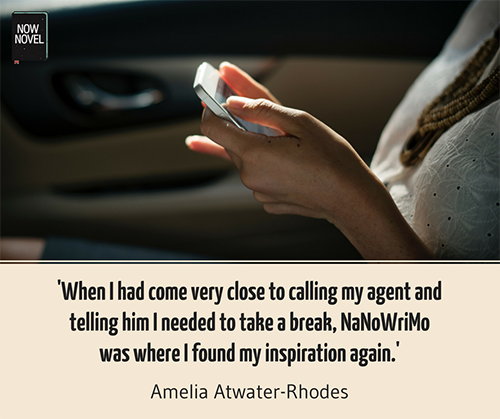 Get and stay motivated for NaNoWrimo and start and finish writing your novel.